In early January 2019, I decided to conduct an experiment to test if a great advocate of human and technical progress is just that, or if it is more comfortable with the status quo. My new book, The Triumph of Classical Management Over Lean Management: How Tradition Prevails and What to Do About It, was submitted to challenge for the Shingo Publication Award. The experiment tested a central idea contained in the book — whether tradition will prevail when useful new ideas and new information are presented. Let me say at the outset that one does not do the kind of work I do — teaching and research — in the hope of receiving awards. Further, at this point in my career, I don’t care about awards and have nothing to gain from them. As an outsider, what is most important to me is to do incisive research on both Lean successful and failed Lean transformation processes, as these two lines of inquiry complement one another. The reasons why classical management is so hard to displace is undiscoverable if one studies only success, as nearly everyone does. The mission of the Shingo Institute is to sustain the legacy of Mr. Shigeo Shingo and to promote and reward operational excellence. As we all know, the human and organizational transformation necessary for OpEx, TPS, Lean, etc., is very difficult to achieve. And success, when it is achieved, has proven to be ephemeral for most organizations. These are the two most pressing problems of our time. The Triumph of Classical Management lifts the veil on what is actually happening so that people have the facts in-hand and can identify countermeasures to try. It destroys the preconception that the key to success with OpEx, TPS, or Lean is changing leaders’ behaviors, and it breaks with the status quo by not conforming to the established lines of inquiry — both of which are essential for unlearning past knowledge and habits. Without this new information, people will continue to struggle and progress will remain limited. If the Shingo Institute were to award my book, then they would be officially confirming the existence of a huge problem, which would call attention to a book that could have the (unintended) effect of driving people away from OpEx, TPS, Lean, etc. Rejecting the book would help assure that it remains unknown to some people who want to better understand the problem and find new solutions to try, thereby diminishing its positive impact. 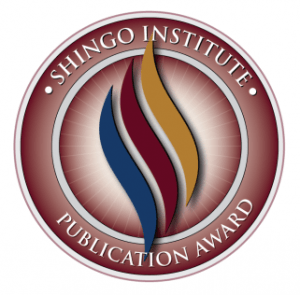 According to the Shingo Institute web site: “This award recognizes and promotes writing that has had a significant impact and advances the body of knowledge regarding operational excellence. The Shingo Institute is most interested in recognizing thought leadership.” In a strange way, and in the big picture, no book has had a significant impact, because CEOs, by a wide margin, remain committed to classical management. The same goes for nearly every business school, from top-tier to bottom-tier, the business press, government, economists, and lots of other people and institutions. It is true that the body of knowledge has advanced significantly, but its skilled application in practice remains lacking in most organizations due to the crippling effects of classical management. And yes, there has been much thought leadership, but it has remained principally within the small OpEX, TPS, and Lean communities. For the Shingo Institute, promoting operational excellence has been the governing preconception since 1988. This creates a status quo, or vested interest, to promote and defend, and thus requires acknowledging works that are unambiguously consistent with its mission. In addition, there exists an enduring sentiment throughout the Lean and allied communities that greatly favors success stories while minimizing or ignoring difficulties and failures, as well as their causes, which is the subject of The Triumph of Classical Management. So, the outcome of the experiment could be ironic; ironic in the sense that an organization dedicated to promoting progress might prefer to not recognize a study that exposes the truth, answers long-standing questions, and provides useful new ideas and new information. If you are interested, you can read the Shingo Institute’s feedback and final decision letter with my comments added (.pdf file, 5 pages). I can not find your paper “A study of executive resistance to Lean” anymore. Do you have a new insights that made you rethink and revise? Hi Ivan – That paper now exists as Chapter 1 of the book, The Triumph of Classical Management Over Lean Management. I’m sure you will find that chapterm abd the entire book to be a very enlightening examination of the institution of leadership. Dear Professor Bob, I am looking forward to reading it. Hope it ships to Europe too. Hi Ivan – The book should be available in Europe.